Piggy's Revenge : Piggy's Revenge 2017. The 20 mile loop preview. My friend Steve, a SCORR board member and co-designer of the routes for the 2017 version of Piggy's Revenge; joins me today in the recon for the 20 mile loop. The weapons of choice for this course. We start at the pavilion on a overcast, humid and windy day. The first section is designed to spread out the riders before the tight single track sections. The combination of a short section of the Red Trail followed by a segment of the Green Trail creates this loop. The red trail/green trail combo. After a short gravel section we dive into Boldlygo, a 9 mile trail built and maintained by SCORR over the last 5 years.The terrain is pretty flat so the trail has many curves to add some thrill to the route. We also try to take advantage of any change in elevation no matter how small. We usually ride this trail on our regular Tuesday night rides, so riding it in the middle of the day is a welcome change. Some of the prairie sections of Boldlygo. Can you see the trail inside the pig ruts? Near the end of Boldlygo. Soon we got into the rhythm of the trail, pushing a bigger gear and accelerating out of the turns and on the straighter sections. Boldlygo is not a technical trail, but you do get challenged when you increase your speed. Although the trail does get a little more technical in the last mile as the trail get tighter and has more roots. As we leave the single track, we ride a short section of the Red trail and soon we are on the Power line trail, at mile 10 we are where our sag stop AKA:Tom's Oasis will be. This notorious stop has been a favorite place to hang out and catch one's breath over the years. Then we take a turn down the Venice Arcadia grade for a grassy section connecting us to Border Road. We noticed that we will have to mow a line in the near future, the grass is mowed but still quite long. Venice Arcadia grade is going to need a little mowing. Gator is a shrinking mud hole. After we bypass a gate on the right side, we are soon on Border Road; a 2 mile section of gravel. We get into a good pace and work our way down this scenic path, while several gators were keeping an eye on us as we traveled into a head wind. This section crosses 3 gates, all with bypasses, and an active pasture. Riders will have to make sure the gates remain closed. After the last gate, we ride Doe Hammock in a Northerly direction. We realized that we might have to do some mowing here too. We turn left onto the South Power line. The route up to this point will be shared by the 40 mile riders and the last 4 miles by the 60 mile riders. All of the riders will end up at this intersection only to take different turns depending on their route. The 20's will go West and the 40 and 60's will go East. 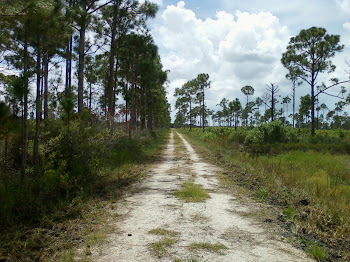 At mile 16 we pass Tom's Oasis' location again, then we are on the red trail riding toward the finish line. The loop ends up being right around 20 miles, and it should be a great experience for all involved.The following link will connect you to a Garmin route.